“Mainstream vegan material is written from a liberal rather than class based perspective. It is basing arguments on charity instead of solidarity, and offering individualistic and consumerist rather than collective solutions. The material often blames the individual choices for the rampant industrialised animal abuse instead of understanding underlying economic and hierarchical structures and empowering people to organise against them. 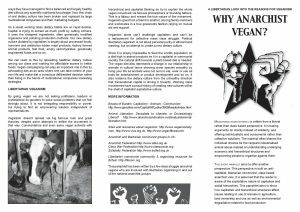 Continue reading Why Anarchist Vegan?